At our office we offer 2 different ways in which you can whiten your teeth. Both of these options use the same materials and methods that you may have seen on the "EXTREME MAKEOVER" television show. The most affordable method is to whiten your teeth yourself at home using the Discus Dental "Nite White" whitening kit which was invented by Dr. William Dorfman, the dentist featured in "Extreme Makeover". With the "Nite White" at-home whitening system, an impression is made of your teeth which we use to make a whitening tray. One to three working days after your impression is made, your tray is ready. You then come in for your kit and instructions. 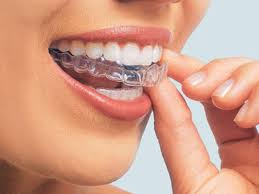 It is then up to you to do the whitening by wearing your tray each night for 2 to 3 weeks. In rare cases, with badly stained, gray, or tetracycline stained teeth, you may find that you would like more material so that you can continue whitening beyond the amount provided. In this case, you may purchase additional material at our office. Make sure to save your tray so that in the future you can purchase more material if you would like a "touch up". Touch ups are completely optional and many people do not feel like they need them, but they are available if you so choose. The second method you may choose is our in-office, light activated whitening procedure called ZOOM! ZOOM! was also invented by Dr. Dorfman and featured on television shows such as "Extreme Makeover", "Oprah", "The Today Show", and "Good Morning America". With ZOOM!, you will come in for a 2 to 3 hour appointment. You will actually be under the ZOOM! light for about an hour. The rest of the time is used for preparation, applying material, clean up, etc. It has been found that offices which do the ZOOM! system alone have some patients whose teeth do not get as white and stay as white as patients who use the take home system. Therefore, our office provides take home trays and material at no extra cost for everyone who has the ZOOM! treatment. If you use the take home material for a few nights after the ZOOM! treatment, it will lock in the whitening from the ZOOM! procedure and make your teeth even whiter. That is how they get the results they do on TV. If you want even more whitening, or if you want to "touch up" in the future, you can purchase additional material. So, with this system you get the advantage of both systems--immediate whitening, plus take home trays to enhance the whitening even more and allow your teeth to continue to be white through touch-ups. Really, the only reason the at-home method doesn't work is because some patients use it for a few nights, then get tired of doing it and stop. We always say that at-home whitening is just like exercise. It is difficult to make yourself do it, but if you do it correctly, and stick to it, you will get a good result. If you stop, or if don't do it correctly, it won't work. If you want your teeth whitening done quickly, or if you know you don't want to do the whitening yourself over many nights, the ZOOM! system is for you. Below are in depth descriptions of first, the Nite White at-home system, then the ZOOM! system. It's safe. It's effective. Most Nite White® users see fast results. So does everyone around them. Nite White® safely bleaches your teeth to lighten discoloration caused by food, coffee, tobacco, aging and other sources. It's a bleaching process that lightens discolorations and removes stains from the enamel of the teeth. The Mint flavored gel is worn 1 to 2 hours per day or night for ultimate performance and maximum convenience. In only 7-10 nights, you can achieve significant whitening results. Nite White® is a fast, safe and effective tooth whitening system. The whitening gel is a thick solution, which is applied by the patient at home using a clear and inconspicuous custom fitted tray. Nothing freshens up your appearance like a whiter, brighter smile. But those "glorified toothpastes" at the grocery store just can't give you the whitest possible smile. Nite White® uses a mild solution retained in a custom made appliance that is worn over your teeth. The active ingredient in Nite White®, carbamide peroxide, has been recognized by FDA for many years as an oral antiseptic and is now used for its superior tooth whitening properties. Unlike traditional desensitizers, Nite White ACP’s patented Amorphous Calcium Phosphate technology rapidly precipitates calcium phosphate crystals on the surface of and also inside dental tubules to substantially reduce transient sensitivity. Enamel is almost entirely composed of calcium phosphate minerals. 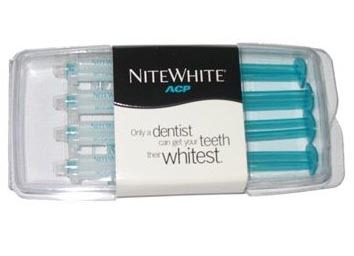 Nite White ACP’s patented Amorphous Calcium Phosphate chemistry naturally bonds with the tooth surface, filling microscopic tooth defects and improving the overall smoothness and luster of patients’ smiles. Additionally, clinical testing shows that patients experience less fadeback after 6 months with Nite White ACP. There are many causes. The most common include aging, consumption of staining substances (coffee, teas, colas, tobacco), trauma, tetracycline (antibiotic) staining, excessive fluoride, and nerve degeneration. Almost anyone. However there are some cases where the treatment may not be effective. 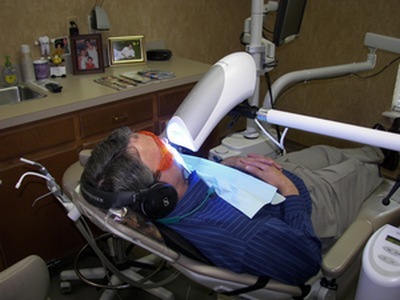 Dr. Cross will determine viable candidates for the process through a thorough oral examination and diagnosis. Tooth-lightening is ideal for patients who have healthy, unrestored teeth and would like to have a whiter, brighter smile. Be aware, however, that if you have crowns or fillings in highly visible areas, these will not whiten and therefore may need to be replaced after you are through whitening. Can I bleach while I'm Pregnant or Lactating? To date, there has been no testing done on the effects of using a professional tooth-whitening system during pregnancy. Therefore, we do not recommend that you use Nite White® if you are pregnant or lactating. Why are my Teeth NOT Whitening evenly? Sometimes the biting edges and the sides of the teeth whiten more quickly than the rest of the teeth. This occurs because your enamel is thicker in these areas and responds faster to the whitening process. As you continue to use Nite White® the rest of your teeth will catch up and the color will blend in. The gum half of the tooth will in nearly all cases be slightly darker than the biting half, as they are naturally, but will have a smooth transition in color. Yes! research and clinical studies indicate that whitening teeth with carbamide peroxide and/or hydrogen peroxide under the supervision of a dentist is safe for teeth and gums. In fact, many dentists consider this whitening process the safest cosmetic procedure available today. Almost everyone gets some sensitivity to temperature, however, this always goes away after a day or two. Your gums may also get irritated, but again, this will go away quickly. No one has ever been shown to have any kind of permanent damage to their teeth due to whitening. A1: ZOOM! is a bleaching process that lightens discoloration of enamel and dentin. You may have seen the ZOOM! process on ABC’s Extreme Makeover. A3: The ZOOM! light activated whitening gel's active ingredient is Hydrogen Peroxide. As the Hydrogen Peroxide is broken down, oxygen enters the enamel and dentin, bleaching colored substances while the structure of the tooth is unchanged. The ZOOM! light aids in activating the hydrogen peroxide and helps it penetrate the surface of the tooth. A study has shown that use of the ZOOM! lamp increases the effectiveness of the ZOOM! gel by 26% or more, giving an average improvement of up to eight shades. A4: During the procedure, patients may comfortably watch television or listen to music. There may be a tingling, sensitive, or very slightly achey sensation, which will quickly go away after the session. Individuals with a strong gag reflex or anxiety may have difficulty undergoing the entire procedure. A5: By following some simple post whitening care instructions, your teeth will always be lighter than they were before. To keep your teeth looking their best, we recommend flossing, brushing twice daily, and occasional touch-ups with ZOOM! Nite White gel. These are professional formula products designed specifically to keep your teeth their brightest. They are available at our office. A6: Sensitivity during the treatment may occur with some patients. The ZOOM! light generates minimal heat which is the usual source of discomfort. On rare occasions, minor tingling sensations are experienced immediately after the procedure, but always dissipate. You can also take ibuprofen and us an anti-sensitivity toothpaste prior to treatment. A9: Almost anyone. However, treatment may not be as effective for some as it is for others. Dr. Cross can determine if you are a viable candidate for this procedure through a thorough oral exam, including a shade assessment. Be aware, however, that if you have any crowns or fillings in highly visible areas, these will not whiten and therefore may need to be replaced after you are through whitening.